Stop wasting time and get the insights you need to make fast decisions in no time at all. Gone are the endless discussions with colleagues. From now on, you can make well-informed decisions based on accurate information. Always have up-to-date information about your competitors at your disposal. 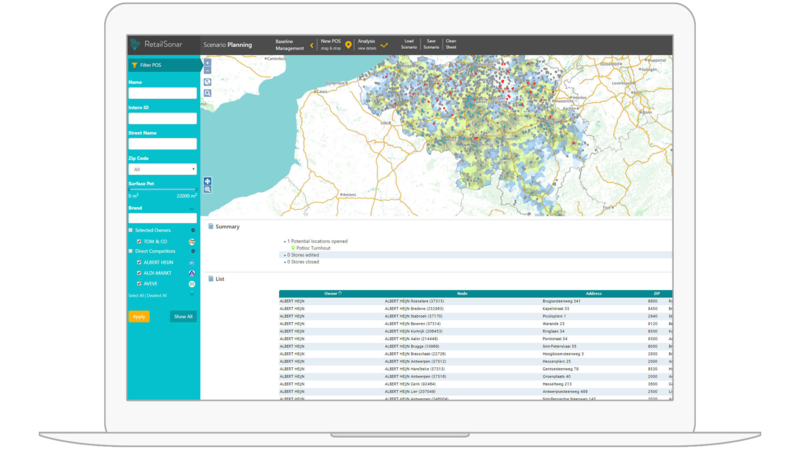 Develop accurate forecast models that revolve around your customer and the impact of his behaviour instead of merely focussing on the location of your own stores. Combine mobility, customer potential, competition pressure and the characteristics of points of sale to predict a location’s performance. Investigate the cannibalisation effect between your stores and your other sales channels (clicks vs. bricks). Examine the external cannibalisation dynamics between you and each of one of your competitors. Don’t lose time any longer. Simulate your scenarios for the future yourself and get objective results. Where are my hotspots, the potential locations with the highest added sales potential? Predict the future impact of your online store or digital sales channels on your existing physical points of sale. What does my optimum, future sales network look like and how can I factor in investment costs and operational expenses?